Unless you carry a flamethrower, there is no perfect way to get your car out of the snow. I managed to figure out pretty much the worst way. On Friday night, in the middle of a snowstorm, I parked my car into a bank of snow. I Tokyo drifted into the spot and felt not a little badass. When I returned to my car on Sunday, I found that that the snow had not stopped falling and had slightly buried my car. Moreover, the soft snow bank I pushed into on Friday night was now ice frozen to the front of my car. How was I going to get my car out? My first instinct was just to drive out. How hard can it be, right? My Volkswagen has rear wheel drive, but it also has a rear engine right over the back wheels. That should give it good traction. It turns out that I have absolutely no instinct for winter driving, given that it only snows once every eleven years in my NorCal hometown. My car was deep enough that I was just jamming the back of my car into a reasonably solid block of snow, and my back wheels weren’t giving enough traction to push me out. So I tried to dig the car out. This was a learning experience, which has imparted me with some valuable advice for anyone digging their car out of the snow. My first attempt at breaking my car loose had me shoveling snow with my bare hands. This was a mistake, as I quickly realized under the snow there was ice. This presented me with a second problem. The only tools I had to dig the car out were a 99 cent plastic ice scraper and an adjustable wrench. The scraper broke almost immediately, but after a short while of hacking away the ice with the handle of the wrench, a very nice dude (pictured, right) loading up his groceries took pity on me and lent me a shovel. This brings me to my second piece of advice. Once I shoveled the snow and ice away, the Baja was practically good to go. I looked around the car and had a third observation. 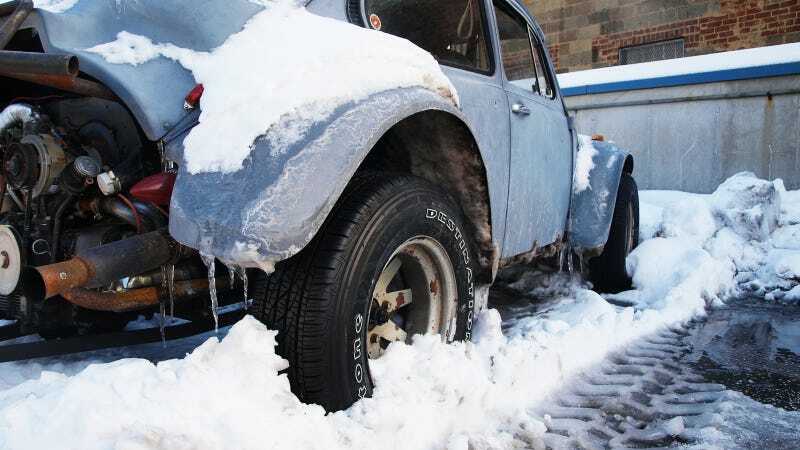 Make sure your wheels aren’t frozen to anything. There was a huge chunk of ice frozen to my back right wheel. I took out my spare dashboard cover and hacked away at it until it fell out. I double checked that the front wasn’t frozen to anything and it was fine. I got back in, hit the gas, and the car was free! In summary, here are those important points again. If you have any other tips so that other drivers don’t make my mistakes, let me know in Kinja below. If you see anything else that I did wrong, give it a shout out. And if you’re from Colorado or Canada or anywhere else where it snows in earnest, feel free to just laugh openly at my idiocy.